Floral Danielle: The Liebster Blog Award! Hello everybody! 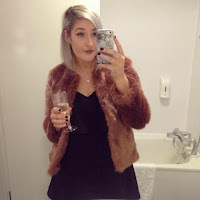 I've been nominated for the Liebster Blog Award by the lovely Maddie at MaddieChannel. Her cute little blog contains beauty tips, thoughts on life and funny pictures of her dog in a laundry basket! 1. Post a link to your nominator's blog with some information about him/her on your blog. 2. Share 11 facts about yourself. 3. Nominate 11 blogs with fewer than 200 followers. 5. Notify the blogs you nominated. 1. I'm 21 years old and my birthday's 29th April. 2. I'm studying Fashion Design at university. 4. I have a massive tattoo on my left thigh, but barely anyone knows about it. 5. I have worked at New Look since I was 16 in both my hometown and uni town. 6. I have dyed my hair XXL Black for many years, and I'm currently trying to get rid of it. 7. I've got two Jack Russell dogs (Spot and Meg) and if you follow me on instagram you'll see how obsessed I am with them! 8. I've got a boyfriend called Joe and he's a right cutie! 9. I made my first ever roast dinner from scratch this weekend with my best friend Courtney, we decided it was time we learn basic cooking skills like a roast! 10. When I go back to uni in September I am doing the 100 days 'no buying' challenge, and as a shopping addict I'm both scared and excited for it to start! 11. Everyday I always wear my gold Casio watch, my Pandora charm bracelet, and my dad's gold wedding ring. I follow so many lovelies I wish I could've nominated you all! And I follow alot of nice blogs but who already have over 200 followers! Thanks for being so lovely and having a great blog! Thanks for have a fab blog and being so nice!